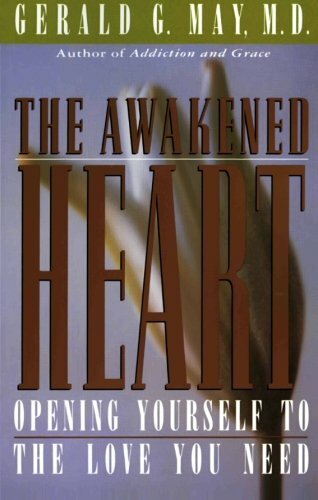 I've been unhurriedly re-reading The Awakened Heart: Opening Yourself to the Love you need by Gerald May. I've read it before and have underlined and dog-earred many a page. Yes, this one is a "real" book and perhaps in it's ongoing "wear and tear" my heart will incur the blessed fate of becoming the very real Velveteen Awakened Heart. I so very much long to live awake and to open my heart to love. Though I like having hundreds of books at my disposal almost immediately on Kindle, there is something truly cathartic about underlining, or penning a comment or question in the margins. And, I have been reading this one reflectively...I read until something "catches" me - stirs me, unnerves me, ignites me - no matter what. Then I stop...and I muse. I ponder. I get curious and pay attention to how it bounces around the corners of my entire being - not just in the top three inches of my body, but my whole body. Where in my body do I feel "openness" or "warmth?" What parts have tightened or does my breathing change when I interact with these invitations. At any rate: May introduces that we can choose one of two ways to live. We can choose either efficiency or love. Efficiency is "how" we do life. Love is the "why." Efficiency asks, "what can I achieve?" and "What's in it for me?" But love longs for something more. In what ways do you seek deeper connectedness - with God, self, nature, others, your work? How would you know you are seeking connection? In what ways have you experienced joy in the past 48 hours - what brought your heart life, aliveness, delight, or curiousity? What draws you right now in your life? Where are you sensing "aliveness"? May writes that touching this desire for more - this desire to love - can be expansive and painful. When the ache is too much, we often try to escape it when by actually dulling our consciousness - with substances (food, prescription drugs, alcohol) or behaviors (becoming a task-master, shopping, working). Take note of the ways you might be dulling your consciousness this week with a substance or behavior. And when you do, simply pray, "Lord, open my heart to trust your love."